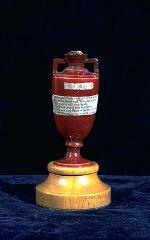 Australia have won The Ashes, again. It's such a pity it wasn't much of a contest this year either. I was really hoping it would be a great battle between two sides that would see the final test deciding who got to "keep" The Ashes for the year. But it wasn't to be. England haven't really challenged Australia in this year's series at all. They did have Australia on the back foot in the last game, but then something broke and everything crumbled. I bet all those people who've bought tickets for the MCG on Boxing Day are going to be a little disappointed. Whilst it'll be a great day for cricket (Boxing Day is always a great day for cricket) it won't have that extra vibe brought on by thousands of fans eager to see who'll take a step closer to ultimate glory. Australia have got there, so it'll just be another great day for cricket.